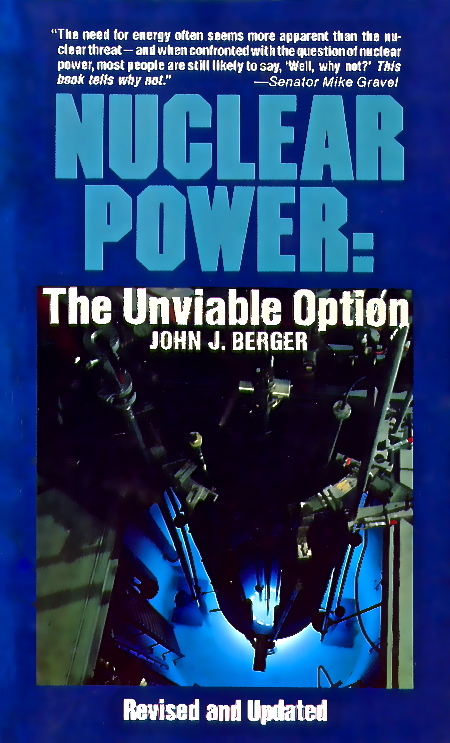 Nuclear Power | John J. Berger, Ph.D. Published three years before the Three Mile Island Nuclear Power Plant partial core melt in Pennsylvania in 1979 and long before the Chernobyl and Fukishima disasters, Nuclear Power: The Unviable Option, A Critical Look at Our Energy Alternatives warned of grave safety and economic problems at U.S. nuclear power plants. Foreshadowing the Three Mile Island accident, the book provides a detailed description of a hypothetical nuclear core melt disaster in a pressurized water reactor like the Three Mile Island plant. In addition to discussing nuclear accident risks, the book contains a thorough discussion of the nuclear fuel cycle including the health hazards of routine radiation releases from power plants, uranium mines, uranium mills, fuel fabrication and reprocessing facilities. Other chapters cover nuclear proliferation and terrorism, nuclear power economics, and the availability of cost-effective alternatives to nuclear power. Technologies surveyed include energy efficiency, solar, wind, geothermal, ocean, and fusion power.